Managing domains, addon domains, subdomains and parked domains. A fast and feature rich webhosting control panel can significantly increase both productivity and quality of any online business or project. Webmasters obtain impressive management tools for performing most crucial administrative procedures for every day account operations with the help of it. In absence of an efficient hosting control panel every webmaster and user would need an extensive internet and OS administration training in order to effectively use their hosting accounts. There are many control panels these days (you can find a list of 4 famous ones at http://webhostingrating.com/articles/2009/12/4-most-influential-control-panels/ ), but not all of them are as popular and widely used as cPanel and Direct Admin. This is mostly due to the unique set of features and capabilities included in the latter two. Although cPanel has a Windows platform version as of today, both cPanel and DirectAdmin are normally regarded as Unix OS designated. cPanel is considered to be the most popular control panel. This is the first name that will likely occur when talking about “control panels”. Apart from being very famous, it is also a rather complex piece of software. Webhosting cPanel has conquered such a huge part of today’s panels market that its main advantage appears to be its own popularity. Since there are so many users operating cPanel, the amount of online tutorials, guides, community discussions and solutions to various issues is humongous. Another outstanding point about it is it’s abundance of expandable features. Anything that can be done with hosting is either directly implemented into cPanel already or can be added as addon. On the other hand, the complexity of this panel creates limitations on the minimal system requirements. Low server hardware parameters and lack of appropriate configuration can cause significant slow downs and even restarts of the panel itself. While cPanel is known to be one of the most sophisticated and feature rich panels, DirectAdmin is known for its extreme user friendliness and simplicity. The well written C/C++ code of DirectAdmin makes it one of the fastest and least resource hungry panels. This panel includes most necessary features sufficient for efficient and comfortable account management. It is thought to have fewer bugs and is regarded more stable than cPanel due to a finer code and shorter list of functions. Direct admin is most often used as a control panel for shared solutions due its lower cost and higher stability. There sections can be collapsed and expanded in order to free up space in your cPanel. One of the inconveniences is a large amount of menus a user has to go through in order to find the button he needs. For faster locating of options there is a handy search bar integrated at the top of left sidebar in cPanel. 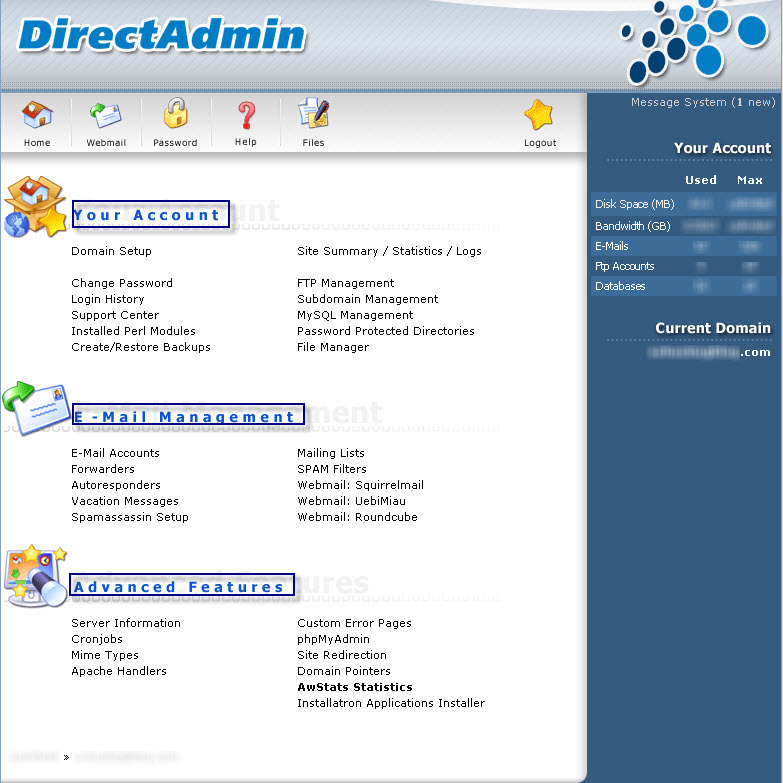 Direct Admin power user interface is split into three main sections: “Your account”, “E-mail management” and “Advanced Features”. Most of the basic account management features such as domain setup, FTP management, MySQL management, File Manager and other are located in the “Your Account” section. This eases up the search and implementation of changes for a user. All the e-mail related activities are done in the corresponding “E-Mail Management” section. This is the only place a normal user would have to go to in order to apply changes to his/her email configuration when using Direct admin web host control panel. The more advanced tasks, such as configuring cron jobs, apache handlers or installing applications using a 1-click installer are located in the “Advanced Features” sections. Both hosting control panels have PHPMyAdmin for advanced database management, as well as one click installers and online website builders as additional addons. There are numerous discussions about the speed advantage of DirectAdmin over cPanel (see http://www.webhostingtalk.com/showthread.php?t=852355 for example), but it is quite hard to determine just how much faster Direct Admin truly is. This is so because such a conclusion can be drawn only from testing results performed under equal conditions on similar production servers with real clients. Overall we can conclude that cPanel features list is larger than that of the Directadmin. Almost any hosting related task can be performed using cPanel’s GUI. On the other hand, some advanced administration actions can be done only via a console in DirectAdmin. cPanel is an older control panel, which, in result, is more widely used and supported by community. This means it’s easier to find free tutorials, recommendations, fixes and free community support for cPanel. As far as Directadmin is concerned: it is written in a cleaner code due to the fewer features implemented in it. This makes it less demanding for resources and faster in functioning. 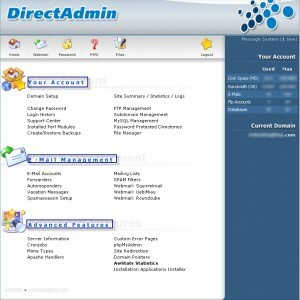 The GUI of Directadmin is more suitable for beginner and medium level users. Nevertheless, all features crucial for hosting account management are present and can be easily accessed through Directadmin. A distinctive property of this panel is its relatively low price: some Directadmin licenses cost twice less than those of cPanel. On all shared plans at Sitevalley.com we provide preinstalled and preconfigured DirectAdmin web hosting panel. This ensures significant speed increase as compared with cPanel and impressive reliability for all users on the shared servers. Dedicated adult server packages are provided with cPanel. At the same time, we also provide cPanel webhosting control panel on our VPS servers for full control and monitoring of your account with us. We also offer DirectAdmin control panel on our Dedicated Server plans for free.